Note: This post is an excerpt from my online book on strategic foresight practice and 21C futures, The Foresight Guide. The latest version lives there. Here is a great question to ask any futurist or foresighter: What have you changed your mind about in recent years? In 2014, I didn’t think that drones for air deliveries and commuting were going to arrive anywhere in the world within ten years, or by 2025. The challenges seemed too daunting, and the investments and competition in the space just too small to make a difference. Since then, I’ve come to realize I was wrong. If I’d been paying closer attention to the enabling technology trends, I would have changed my mind. The US, China, Dubai, and Israel are all experimenting with these today, and all of these and many other places are likely to allow commercial operations by 2025. Dubai is moving first, with their future-oriented leadership, with a maiden air taxi test flight with Volocopter in Sept 2017 and a planned first commercial service launch with eHang this Summer. So let me ask you: what big future events have you changed your mind about in recent years? I’d love to hear your thoughts in the comments below. As we’ll now see, a fantastic and incredibly profitable new global mobility solution is now on our ten year horizon with passenger drones (aka “multi-rotor electric AVs”) and their less-recognized cousins, droneplanes (aka “fixed- and variable wing EVTOL AVs” – that’s a mouthful). Purists remind us that “drones” originally referred to only the unmanned variety, but everyone is now calling these human-carrying machines drones as well, and I recommend you do too. It’s a perfectly good one-syllable word. These new technologies are going to solve our centuries-old problem of urban gridlock, by safely, quietly, and sustainably moving the transportation of growing quantities of goods and people into the third dimension, the air. Unlike digging under ground, which will go far slower, these systems will take us nearly point-to-point, they are far easier to scale, and their load can increase with demand, with no additional construction costs. In coming decades, these clever new machines will be built into very fast and efficient air delivery and air taxi networks, on-demand services that can achieve incredibly high densities in leading cities. Using them will be expensive in the 2020’s, and it is my hope that we’ll see air deliveries for urgent goods first, but the most exciting application, multipassenger commuter drones, should start to get mass-affordable for daily use in the 2030s. So just like we see with pollution, spam, and other technology-created or enabled problems, we can predict urban gridlock will subside, at an accelerating rate, as these networks start to seriously scale in the 2030s. Consider that removing urban gridlock is a far more exciting and valuable objective than, for example, going faster between major urban areas. Even if we had a Hyperloop train between LA and San Francisco today, we’d still be stuck with the awful traffic in each of those destinations once we got there. It’s the 30 billion hours that American’s spend commuting each year, the full week of each of our lives that we waste in traffic annually, that are the top transportation problems for urbanites everywhere. Self-driving cars are part of the solution, but they are going to be stuck on our gridlocked road systems, just like every other car. With the arrival of safe, cheap, and quiet air taxi networks, we can finally see the full solution ahead. Because drone networks are more like point-to-point-capable trains than cars, which sit unused 95% of the time, we’ll need a lot less of these vehicles than most of us might initially think, to serve all our leading cities in coming decades. The two-passenger Volocopter, being tested in Dubai (Jun 2017). Today’s drones and droneplanes are noisy, unsafe, non-autonomous, expensive, and range-, speed- and power-limited. We also can’t imagine how they’ll be beautiful, if too many of them are flying around in the air. But all six of these critical adoption problems are being rapidly solved today. Let’s briefly discuss each of these issues now. 1. Noise. To be allowed in the air in large numbers, package delivery and commuter drones will have to be far less noisy than our current quadrotor drones. Fortunately, the more rotors one adds, and once each rotor can adjust to operate at a slightly different RPM than the others, the quieter drones become. The Daimler-backed Volocopter pictured above, with a particularly safe 18-rotor design that also incorporates a whole-drone parachute, presently claims to be 7X quieter than a helicopter. These drones become even quieter when you enclose the rotors inside a carbon-fiber tube, creating a ducted fan, which we already find in designs like the Lilium and Urban Aeronautics drones today. A multifan design like Lilium’s (below) seems like it has the potential to be the quietest. The rotor-enclosing tubes can be noise insulated, and the edges can be dynamically adjusted by micromotors, to make the the air rushing through them even quieter yet. NASA has been at the forefront of making quieter drones for several years. We just have to mandate low-decibel designs in our cities, as we will surely do, even before they are in the air in any significant numbers. Stealth startup Joby Aviation, one of the leaders in the drone race today, whose design we haven’t seen publicly yet, plans to make their drones 100X quieter than a helicopter on takeoff and landing, and silent when flying over private residences. That would surely be quiet enough for mass adoption. Fortunately, sound levels drop 6 dB with every doubling of distance, so we can require our air delivery and taxi drones to fly high enough not to be heard. Unless they are low-noise engineered, most of today’s drones might have to rise above 3,000 feet before finding a virtual lane in the sky. In some urban areas, drones may allowed to fly low over highways, adding to highway noise. But I hope that doesn’t happen. I think we citizens should fight to reduce our current levels of noise pollution. We need to measure and reduce urban noise, not keep adding to it. Perhaps a generation from now, I expect our better droneplanes will have articulating wings as well as ducted rotors, making them partly like ornithopters. That will allow them to do gliding landings, and flapping takeoffs in their first few hundred feet before turning on their rotors, making them silent even on takeoff and landing in residential and other noise-sensitive areas. That would be an example of bio-inspired design we could look forward to seeing. That kind of of robotics is technically beyond us today, but it surely won’t be in a few more decades. 2. Safety. People have a very negative psychological reaction to things falling out of the sky. Some of our worst nightmares are of large birds, snakes, spiders, or other things falling down from above us. This emotional sensitivity may be a holdover from our primate ancestry, when we lived in the trees. Tree-dwelling primates get particularly freaked out by eagles or snakes above them. We humans obsess out of all proportion over plane accidents versus ground accidents, perhaps due to an evolutionary bias, or perhaps because we think of plane accidents as particularly outside of our control, and something that, unlike cars, we can do without. Whatever the cause of this sensitivity, we will need a set of smart technologies and strategies able to quell this reaction as drones increasingly proliferate. One strategy to get people comfortable with drones is to show that they are uniquely helpful in improving public safety. Israel’s Urban Aeronautics is working on a drone ambulance system, a bold and clever early use case, wherever there is political will for better emergency services. These would be much more useful and inexpensive than today’s helicopters. Human-carrying rescue, police and military drones are also of great value. But as David Brin keenly observes in the Transparent Society, democratic societies desire at least 20X more of these scary technologies (drones, cameras, AIs, guns, etc.) in public hands than in governmental hands. That is why air taxis and privately-owned personal drones are also such critical developments. We don’t want to live, or feel like we live, in an Orwellian state. Fortunately, advanced safety solutions exist today, or are on the near-term horizon. Some of these are expensive, but in the best of all worlds, I hope we’ll require them all before we see drones in large numbers flying overhead. First, notice that the more rotors one adds, the safer they become. Multi-rotor design allows drones to have double and triple power system redundancy, with each rotor group running on separate circuits. Each rotor group is like an independent swarm of birds holding you up, and each rotor group can auto-land the drone if the others fail. This redundancy is another great example of bio-inspired design. Until they have wings, and can glide like birds, I think both package and commuter drones should also be required to have drone parachutes that unfold rapidly above the drone (via electrical acceleration, compressed CO2, or airbag-class explosives) in case of mechanical failure. Skycat is one of several companies that offer such rapid-deploying parachutes for small drones today. Companies like Ballistic Recovery Systems are leaders in putting lightweight whole-plane parachutes on small planes. Their home page credits these parachutes with saving 376 lives so far (2018). Watch this video of an acrobatic plane safely landing after its wing falls off (at 2:20 if you want to get right to the event), if you don’t believe these work. Whole-drone parachutes can be made very small and light, and I hope they will be required in all future non-winged urban drones, in every country. Our coming drones also should have an airbag ecosystem that rapidly deploys inside and below the drone, triggered by AI, accelerometers and sonar, a system that is also deployable manually in case of AI failure. The REAPS system of external airbags is an excellent example of safety tech that all our airborne drones need. It was trialed by the very innovative Israeli defense company Rafael (makers of the Iron Dome air defense system) on helicopters for the US Navy in 2005 (picture below). These airbags offer excellent protection for occupants in low-velocity crashes, but unfortunately, there’s never been the political will to make them necessary on any rotorcraft anywhere yet, military or otherwise. Let’s hope that changes soon. REAPS airbag protection system, developed by Raphael ADS in 2005. These really work! Such an ecosystem should protect people in the drone and on the ground if there are system failures below 150 feet, the rough height below at which our fastest-deploying full-sized parachutes can safely lower ultralight aircraft in case of electrical or mechanical failure. For mechanical failures at lower heights than this, both passenger and package drones will need both rapid-deploying “drogue” parachutes (which only slow you down) and airbags to keep folks in the air and on the ground from getting hurt. For commuter drones, you can place airbags on shoulder harnesses, in the cockpit, and below the craft itself, and the benefits multiply the more you have. Energy-dissipating (“stroking”) seats also protect airborne occupants in crashes. Below-helicopter airbags have even been tested in heavy Apache military helicopters, and they were famously used on the Mars Pathfinder lander. Again, such airbag and drogue parachute ecosystems go a very long way to turning any drone into a “beach ball”, protecting its occupants, and folks on the ground, from lethal decelerations. Though they may initially be expensive both to produce and to safety test, I hope that an advanced airbag ecosystem will be required on coming air taxi drones, and I hope external airbags and parachutes are required for air delivery drones as well. If we are being really foresighted, tomorrow’s commuter drones will also have lidar or millimeter wave radar to augment their sense-and-avoid software, giving them all-weather visibility and navigation, so they can operate safely in fog, clouds, and rain, and continually avoid birds and other aircraft. I find it sad that we don’t see radar in almost all of today’s commercial and private planes. Along with sense-and-avoid software, it would allow planes to avoid things like bird strikes, telephone poles, balloons, and other objects hidden in fog, clouds, and rain. Millimeter wave radar has been added to some private helicopters today, so it isn’t a matter of cost, size or weight. Rather, it’s a failure of regulatory vision and leadership. I don’t know the global statistics for annual average mid-air collisions or near misses. But a ten-year study (1989-1999) of mid-air collisions found an average of 1.5 such collisions over French territory annually, collectively causing forty-two deaths and nine injuries. Extrapolating this, I’d guess that at least twenty mid-air collisions happen around the world every year, and vastly greater numbers of near misses. In the US, the Aviation Safety Reporting System collects reports of near misses, but reporting is of course voluntary and selective. Fortunately, aviation authorities say numbers of both of these are continually declining per passenger mile. But if we are going to add tens of thousands of delivery and commuter drones to the air, I think we need to mandate lidar or radar, and sense-and-avoid software that allows the drone to avoid other objects, both on the ground and in the air. Our software and hardware are certainly up to this safety challenge. We could start by subsidizing sense-and-avoid technology and software advances in today’s consumer and industrial drones. 3. Autonomy. In their most important safety and performance advance, coming drones will have to be self-flying, or acting as a continual backup if humans are flying, so that they can self-fly whenever safety margins are violated by human pilots. The best human-carrying drone designs, in my view, should always allow a passenger the option take over manually at any time. Drone flying can be dead-simple, with a single joystick, as in the human-carrying Volocopter. In practice, however, few passengers might ever do that, preferring to let the system fly itself. Given the very high rates of human error in piloting today’s automobiles, and the 1.3 million auto fatalities the world presently suffers every year, I hope that we’ll demand near-full automation, equivalent to SAE Autonomy Levels 4 or 5 for automobiles, before we allow many drones the sky. I also hope for much better safety systems to protect folks on the ground. Passenger drones need onboard collision avoidance that assigns them their own virtual lane in the sky, space-keeping precisely with other drones, and communicating with ground traffic monitoring systems that can do remote emergency landing, as in the leading Chinese passenger drone, the eHang 184. In this vision, today’s air traffic control systems gain even more ability to control, but they take that control only when on-board autonomous or manual flight systems make mistakes, or when security parameters change for the airspace. We need such top-down control, including the ability to auto-land all airborne drones, to address the eventual problem of terrorist-weaponized drones. No advance is without its potential downsides, and plenty of our dumb cars and trucks have been turned into lethal devices already. Building drone immune systems, including networks of police and defense drones, is the only strategy smart and scalable enough to combat drone misuse. This self-flying ability, and the ability to keep human pilots from doing unsafe things, has been steadily growing in commercial aviation, and as autonomous cars emerge, driven by hardware and software pioneers like Nvidia, we are going to see it explode in its ability. Visual recognition in 3D in the air is in some ways an easier autonomy problem than it is on the ground, with its constant near-field visual distractions. Tesla has already mostly solved the problem of self-driving automobiles working with human drivers and preventing them from causing accidents, as we see in the Tesla Autopilot. It won’t be long before someone brings triple-control navigation (AI, pilot, and ground control) to the drone platform. Perhaps DARPA’s OFFSET program for military drones will do it first. The leading Chinese passenger drone, the single-passenger eHang 184, commendably has fully remote piloting (ground control) and they claim to have full self-flying ability as well, though I doubt it is Level 5 autonomy. Most crucially for me, they haven’t tried to solve the most socially valuable problem, the one Tesla is working on, of creating a form of autonomy that allows both pilot and AI navigation. That kind of human machine partnership, one where the AI gives us the option of control when we want it, but also actively prevents us from being unsafe, is the only kind of AI that makes both us and our machines better partners. Such “Partnership AI” is the kind of AI we deserve in all our complex machines. The kind of AI that takes away our agency and abilities, the kind Waymo is developing for its self-driving cars today, is a big step in the wrong direction, in my view. It’s time we held our increasingly intelligent machines to a higher standard. They need to empower us, not make us weak and dependent. There’s one more thing we should say about drone autonomy. Even with today’s low autonomy systems, drones and droneplanes are far more able to do precision flying than ordinary planes, which drift uncontrollably tens to hundreds of feet up and down with the wind, a problem that is greatly magnified by bad weather. That little-discussed fact is another reason why drones will be the most popular form factor for urban aerial package delivery and commuting. Conventional planes, airships, and other forms of flight just can’t fly precisely enough, in all types of weather, to be allowed in our urban airspace in any large numbers. While we may use airships for heavy lifting applications, self-flying drones and droneplanes are our majority future. 4. Cost. Early versions of truly safe and fully autonomous drones will surely cost over a hundred thousand dollars, putting them outside the price range of the average consumer. But once these are used in on-demand networks, those costs are easily amortized. Even a single-passenger drone should be able to shuttle five to ten people to work, and home from work, every workday, and be available for other commuting in between. Multi-passenger versions will be even more efficient and affordable. We’re already seeing a few drone designs, like those of Joby Aviation, that carry four passengers. Air taxi commuting cost will start high cost, and be only for rich folks for the first few years, like the first Ubers, the black cars, but it will rapidly drop as adoption scales. 5. Range, Speed, and Power. Today’s battery electric drones only stay in the air for 20-30 minutes, and most of the current designs are only good for lifting two occupants, a driver and a single passenger. But as they follow inner space trends in STEM efficiency and density, lithium-ion batteries have, on average, become 7% more energy dense every year, since first introduced in 1991. That means they double their range per weight every ten years. One more range doubling should be plenty to cover the 22 mile average round trip distance of the typical commuter in a multi-passenger drone, plus an additional safety margin to get back to the droneport and swap batteries. Hydrogen-powered drones promise to have vastly greater range, reducing the need for recharging or battery swaps. Autonomy will eventually eliminate the need for a driver. Current human-carrying drone designs can fly at 65-80 mph, and droneplanes with ducted fans can fly at up to 180 mph, point-to-point with no congestion. These speeds are already fast enough to be highly useful, and they offer major advances for package delivery and commuting in our gridlocked cities. 6. Beauty. We could let these drones fly everywhere, randomly, or we could make them do virtual lane-keeping. We could require them to climb higher when there’s traffic, so they stack above each other as high as is necessary, and so that most of our sky stays open and quiet. Once they have lidar or radar, they can fly and lane-keep in all but the worst of weather. Requiring lane-keeping would allow us to see orderly and beautiful “ant trails in the sky” when we look up over head. If we don’t like seeing them at 2,000 or 3,000 feet, we can push those trails as high up as we like. Like our drone sky art today, we can make those aerial migration patterns orderly, beautiful, and inspiring, if we choose. In short, we’re off to the races, and these technologies are going to bring huge changes to both our urban and rural environments in coming decades. Triple-control navigation. Autonomous flight ability, with manual control when the system judges it safe, and remote piloting ability by ground air traffic control. Ballistic parachutes (whole-drone and drogue) and airbag ecosystems, to protect both people on the ground and in the air. A low-noise requirement, which will force turbofan, multirotor or multi-RPM design, fast takeoffs and landings, and higher elevation operation. A 60-minute range requirement, which means gas, gas-electric hybrids or fuel cells today, and in just a few more years, li-ion batteries. Full-weather visibility (radar and lidar), which improves safety, and offers a redundant orientation system besides computer vision. Lane-keeping. Rather than letting all these drones fly about, willy-nilly, let’s see aerial migration patterns that are orderly, pretty, and inspiring. Research use should continue to be allowed without such regulations, but the numbers of drones in those cases should be small. These regulations might delay the arrival of commercial drones in the US to at least the mid-2020s, and make it harder for small companies to launch services in the early years. But requiring higher standards is I think the price we should pay to protect this nascent industry as it emerges. You may disagree with my views, but hopefully this analysis at least helps you better see what is possible. We will decide these issues politically, as always. So where are drone science, tech, and regulation today (early 2018)? The Trump Administration has recently allowed US states to draft their own provisional licences for drone delivery experimentation, subject to approval by the FAA, but the regulatory vision for these machines is still far from clear, and doesn’t include all of the five things listed above. Talk to any ordinary person about these futures however, and noise and safety concerns come immediately to mind. 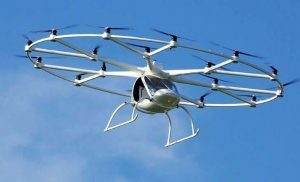 Human-carrying drone startups like Volocopter, Boeing-Aurora, eHang, Kitty Hawk, Lilium, Urban Aeronautics, and Joby have made new progress toward the air taxi vision over the last few years. On March 30, 2016, the Volocopter (picture left) made the first manned test flight using redundant electrical systems. That was a big first for this nascent industry. It can fly at 65 miles an hour, plenty fast enough for urban commuting. Vehicles like Boeing-Aurora’s droneplane (“EVTOL”) design (picture right) will be able to fly even faster, at least 100 mph, enough to commute from nearby cities. eHang 184. The most visible passenger-carrying drone platform, at present. Big in the news these days is eHang, the small Chinese company most visibly leading the air taxi space at present. They are now (Feb 2018) doing a limited number of passenger flights with their eight-rotor drone, the eHang 184. It has a current max speed of 62 mph. eHang’s innovative design has backup rotors, autonomy, and remote control flying ability, which are all great advances. But it still has no airbags or parachute, and no option for pilot control. Unfortunately those rotors are going to be quite dangerous to folks on the ground in an emergency landing, versus a quieter and even more redundant multirotor design like the Volocopter. If eHang wants to keep this particularly efficient design, their landing gear should telescope higher than a standing human in any emergency landing (see picture above). They also need a whole-drone parachute. I wish eHang had higher safety standards, and the ability of occupants to at least manually deploy parachutes and airbags, because a major accident with any passenger-carrying prototype could easily set back both R&D funding and public interest in this market for several years. 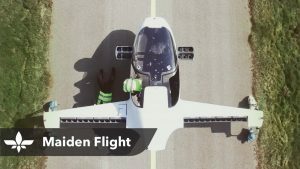 The German startup Lilium has even built an EVTOL jet (picture and video below), with a max speed of 180 miles per hour. Its 36 redundant electric “jet” (ducted fan) engines are also particularly quiet compared to traditional rotors. They are also claiming a one hour flight range, though I would bet that’s marketing hype, and I’ll believe that once I see it. Take a look at the video below right of their 5 min maiden flight in April 2017. All of these designs, and others we haven’t seen yet, are capable of turning collections of smaller cities into commuter megacities in coming years. Besides self-flying ability, one problem none of these companies have yet solved is range. They all use lithium-ion batteries, so most can only stay up for 30 minutes at present. Fortunately, lithium ion energy density (range) has grown 7% a year since 1991, as mentioned earlier, and may continue on that trend for at least another decade as we get increasingly sophisticated in our nanochemistry and nanoengeering. By the mid-2020s, battery powered drones and droneplanes should have some very impressive range. In the meantime, Hybrid gas-electrics are the most obvious bridge solution, and I think we can expect gas-electric hybrid droneplanes to be the leading designs for the next decade. But hybrids aren’t long-term sustainable. Fortunately, fuel cells offer long flight times already, and can be used sustainably, if we charge them with renewables. We may not subsidize their use and performance development today, but we should if we were being more foresighted. Ten years from now, in the mid-2020s, a future version of Li-ion should be able to deliver the 60-minute plus flight time for multipassenger drones that air taxi networks may need. That is also when I’d expect such networks to be offered commercially in the US. Hopefully, gas-electric hybrids will start losing out to the greater simplicity and sustainability of battery drones for urban air delivery and taxis around then, though they will surely continue to be used for long range flights. With luck, fuel cells will also get a share of the coming air taxi market at that time, as they offer the longest range sustainable power solution for the foreseeable future. Even so, fuel cells may be reserved for inter-city, rural, and high-performance drones, with batteries winning out in the cities. Let’s look a bit deeper into hydrogen fuel cell technology now. The simplest way to store hydrogen for aviation is as a compressed gas, in carbon fiber tanks. These already offer about half the range of fossil fuel airplanes. A 2X range improvement, making hydrogen nearly as energy-dense as fossil fuels, can be achieved with cryogenic tanks. See Juan Plaza’s Will Hydrogen Fuel Cells Help Drones Stay in the Air?, Commercial UAV News, 6.5.17 for some recent developments. As R&D progresses, cryogenic tanks may get much more affordable, and increasingly be used for long range applications. MMC, a Chinese manufacturer of industrial drones, has built HyDrone, a small fuel cell powered drone for industrial and military use. Their two models have a flight time of 2.5 and 4.5 hours, a 3-4X better range than our best current battery drones. In the US, Ballard’s Protonex also makes fuel cell-based for drones, primarily for military applications. As this 2017 whitepaper shows, they presently offer 2-3X better range than the best batteries. In Canada, EnergyOr is making fuel cells for sale in drones, and droneplanes, including the Tron H2, which does vertical takeoff and landing and has an incredible eight hour flight time, roughly 7X better than our best battery drones. Our US Navy Research Lab has also built the Ion Tiger, a 35-lb, 5-lb payload fuel cell fixed-wing UAV which flew for 26 hours in 2009 using compressed hydrogen fuel tanks, and 48 hours in 2013 using miniature, NRL-developed cryogenic tanks. Again, the longer the range you need, the more fuel cells, if they can keep getting more dependable and affordable, may become the best power option, as they offer both a much higher energy density and more rapid rechargeability than batteries. We shall see. The Tron H2 (2017, YouTube, 2 min). 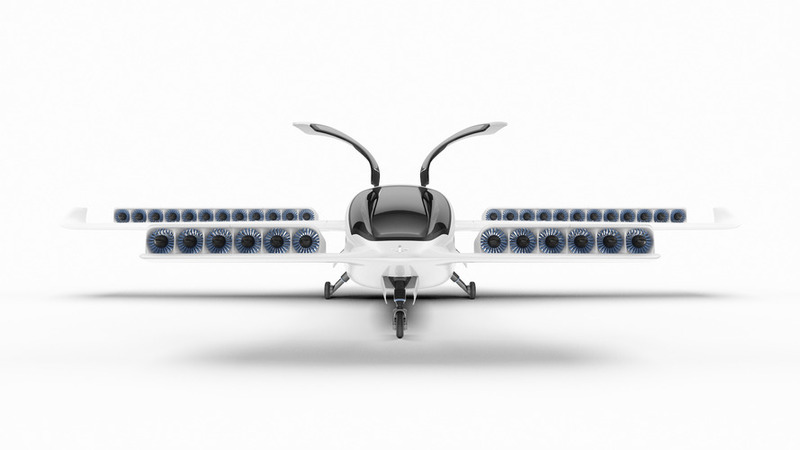 A long-haul fuel cell droneplane. Droneplanes for Navy ships and other military, intelligence, disaster, fire, and work environments are a great first-tier application of droneplanes over the next decade. See the video at right of the Tron H2. Platforms like this are being looked at by a number of defense customers today. For you VCs and big company leaders, I’d argue that a small company like EnergyOr is an ideal company to be invested in or acquired for defense drone production today, and they could be positioned for package delivery drone production in the early 2020s. I would also hope that commercial air delivery drone networks will arrive ahead of commercial air taxi networks by at least three to five years, as the physics, safety, and regulation issues are so much easier to work out for that application. Unfortunately it presently looks like the reverse is going to happen, as drone commuting is such a mesmerising and high-value application. So let’s at least make air taxi safety our first priority. Taxi and delivery drones will be particularly useful in rural and mountainous areas, with bad and indirect roads. Imagine what an on-demand drone network, first for packages and a few years later for people, will do for the value of mountain and urban real estate presently an hour or more from any big city by car. Hold on to that real estate, friends, if you have any. Your transportation options will start to get a whole lot better about a decade from now, in my estimation. Drones that deliver people or packages to our homes and offices need places to drop their packages without landing, places to land temporarily, and places be hangared and serviced when not in use. Good generic names for such places might be droneboxes and droneports. Feel free to use these names if you like them, or suggest others. Perhaps a courteous reader will make us some Wikipedia pages for these two topics as well? We can envision droneports and droneboxes on the roofs of commercial and apartment buildings, in our residential front, back, and side yards, and in many other locations. The top of a typical residential dronebox may need to be at least seven feet above the ground, higher than dogs can typically jump, and it should be able to protect packages from thieves and bad weather including rain, show, and hail. Look at the following two patents Amazon has filed for droneboxes and droneports. I like how bio-inspired they are thinking. 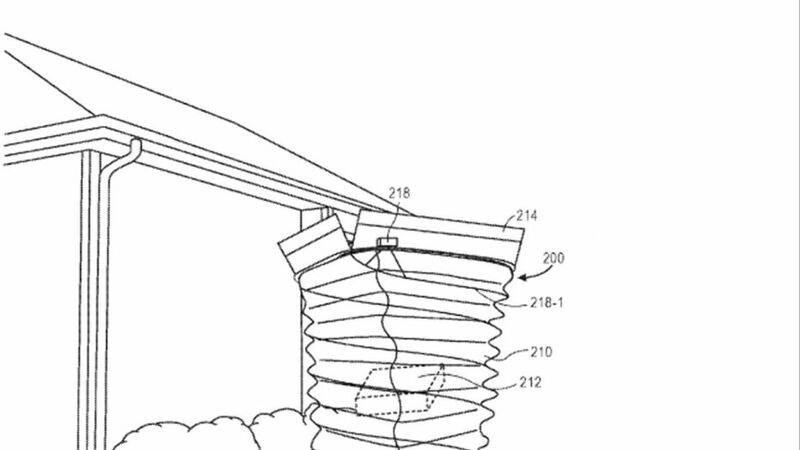 The patent at left shows a package-accepting dronebox that is essentially like a flower. It opens up its “petals” at the top when the drone gets above it, it slows down the fall of the package to the bottom, presumably via stiff plastic “hairs” inside, the bottom is presumably accessible via a locked door, and closes its petals after deliver to protect against inclement weather. The accordion-aspect of this design seems unnecessary. Most of us would rather have a chimney that doesn’t move, one we can store multiple packages within. Such a dronebox will likely have an internal sensor to report when a package is delivered, and some droneboxes may allow drones to land and recharge on their roofs, extending their range. 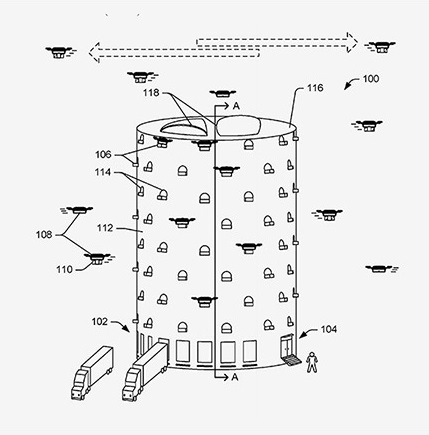 The Amazon patent at right shows a “beehive like” droneport they might use as a regional hub, with their warehouse at the bottom, maximizing surface area for drone takeoff and landing from the local distribution center. Again, the bio-inspired design is quite beautiful. 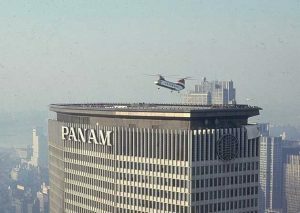 Pan Am Heliport in NYC, 1970. These will return in the 2030s, as Droneports. As we think of the future of passenger drones, we can hope that progressive countries will ban gas-only drones, requiring gas-electric hybrids at least, with both electric fast chargers and hydrogen filling stations at all the major droneports in the city. Ideally, our suburban droneports will be at least three stories high, with petal-like sound baffles extending out from the landing pad at the top, minimizing noise and eliminating air flow on the ground. As Elon Musk likes to say, we won’t be landing passenger drones in typical suburban backyards, as anything of ours or our neighbors not tied down might blow away. 🙂 That fact, and noise minimizing, are why I think our suburban droneport zoning will either require a lot of acreage or being up off the ground. Those of us without all that acreage will use suburban droneports, ideally a few minutes from our homes by car. Many early suburban droneports will likely be retrofit office buildings, like the old PanAm heliport in NYC (picture right). But the most space-efficient would be multi-story drone hangars with elevators, allowing long-term parking (of cars and drones both) and efficient servicing by onsite mechanics. Such multi-story drone hangers and parking garages will give city dwellers and commuters more places to park their self-driving cars, and the parking capacity needed for high-demand destinations. Underground automated highways for self-driving electric vehicles, electric subways, and perhaps also Boring Company networks, will eventually link our urban droneports as well. I wrote a detailed forecast about such underground highways in 2005, and predicted they’d start emerging in our wealthiest cities around 2030. Underground transportation networks will support the largest passenger volumes, but they’ll also be far more expensive and scale far slower than drone networks, which I simply did not see in 2005.
Who are likely to be the major players in this new industry? Let’s look at just a few of the more obvious contenders. For air deliveries, Amazon has been making the biggest moves, in an initiative they call Prime Air. Amazon now has truly global scale. In 2011, they had 33,000 employees. By the end of 2016, they had 300,000, hiring 100,000 people in that year. They are hiring at least 100,000 more in 2017, mostly for warehouse work. Imagine how much bigger they will get once they figure out package delivery drones. Hold on to your Amazon stock, friend. Amazon announced their Prime Air R&D effort with a bang in 2013, and a modest prototype (picture left) initially to much skepticism. Their 2015 design (picture right), able to deliver packages up to five pounds, is greatly improved. It is a fusion of drone and plane that the aviation industry calls an EVTOL. As I’ve said, I prefer the simpler and equally descriptive term droneplane, and recommend it to you. Droneplanes take off and land vertically, but can also fly like planes, so they are particularly fast and efficient for longer distance flight. 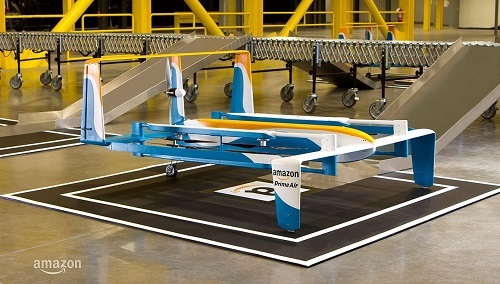 Amazon’s current droneplanes are still all electric versus fuel cell, they aren’t quiet, and they can still hurt people by falling from the sky. But they are pursuing fully autonomous flight with “air traffic” like human supervision, and since 2015, the FAA is granting research exemptions for such systems. So they’re making progress. For air taxis, Daimler is positioning itself very cleverly by investing in the Volocopter, my second-favorite air taxi design at present, after Lilium’s, another German startup discussed above. Daimler’s stock may be a very good buy and hold right now, as few folks realize their leadership pivot into this massive new industry. Mobility is a $10 Trillion dollar annual industry, and passenger drones are going to be a very big part of that. If Volocopter can rapidly develop autonomy and on-demand software, and add external airbags, I could easily see Daimler taking the lead position in this nascent industry. Tencent-backed Lilium could do so as well. Uber is the most visibly working toward self-flying commuter drones, in an initiative they call Uber Elevate. They published a whitepaper articulating the value and feasibility of these services in 2016, formed a research partnership with Aurora, and started an inaugural Elevate Summit in 2017, to jump-start this nascent industry. Their first conference had 72 industry speakers on various issues in manufacturing, regulation, and investment around urban commuter drones. See this great video by Dagogo Altraide, Uber’s Electric Flying Taxis, ColdFusion 7.28.2017 (YouTube, 12 mins), for more. Uber has had moral failures and missteps of late, but they seem to be making necessary changes, and I expect they will eventually get through those unfortunate issues and rebound. Consumers will want on-demand systems, commercial services, and private leasing and ownership as major options, as that competition will drive down the cost of air taxi services as fast as possible. Of each of these, I would expect the on-demand model to support the largest and most affordable daily ridership relatively soon after network launch. The cheaper it becomes for private individuals to own, hangar, and pay for service certification for their drones, the cheaper air taxi services will become for all of us. Blade is already lowering the cost and ease of helicopter commuting in NYC by a factor of four, contracting private helicopter owners to fly others in their helicopters on demand. So in the first ten years of drone network launch, the cost of a short urban aerial hop might be equivalent to taking an Uber Black today. Maintaining drones should neither be prohibitively expensive for wealthy private individuals nor particularly cheap. Without any research behind this guess, I’d imagine the commuter market might be something like 70/20/10 (on-demand/commercial/private) ten years after it first becomes legal for individuals to fly passengers for hire in any city, but that’s just a hunch. Much depends on cost and reliability. Boeing is a top contender for making commercial drones for our air taxi networks. In 2017 they purchased Aurora, aligning them with Uber. Aurora makes not only an EVTOL, they also make Orion, a stratellite platform (a topic we’ll discuss those in another post), and several other defense UAVs. Boeing is another very smart company I’d recommend for your long-term investment portfolio. If I was to bet, I’d predict that Boeing will try to buy Monterey’s Joby Aviation, a stealth startup that has been working in this space for years and that just got a $100M investment from Jet Blue and others. We haven’t seen it yet, but some say their passenger-carrying droneplane is the most advanced yet. Airbus is also positioning publicly to be a player in the drone delivery and commuting space. 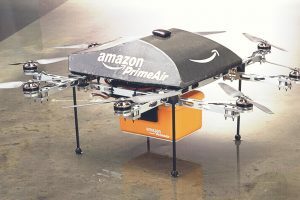 They began working with the CAA in Singapore to test drone parcel delivery in 2017, using an autonomous platform called Skyways, on the National University of Singapore campus. Through direct innovation or purchase, like Boeing, they are also likely to be leaders in exploring this space. Google’s spin out Waymo may also become leaders in in self-flying drone software, if they raise funds for that, and Google-affiliated Kitty Hawk might become a leader in software and services for drone pilots. Kitty Hawk’s CEO Sebastian Thrun originally ran Google’s self-driving car project, and they are funded by Google co-founder Larry Page. Commendably, Thrun’s Udacity is offering a nanodegree in Flying Cars and Autonomous Flight, and hoping to get at least 10,000 engineers taking the course. There have been a growing number of such MOOCs for consumer drones in recent years, and they are a great way to train up the next generation of drone engineers. Will Waymo/Kitty Hawk develop an open drone navigation software platform something like Android, able to be partly customized by a wide range of drone manufacturers for either drone delivery or commuting applications? I would doubt it over the next five years, publicly at least. Given the high safety concern and the quality control problems with that approach, no big company will pursue this initially, and small companies and startups likely don’t have the capital to make it work. I think we can expect proprietary navigation platforms to dominate for at least the first five years of commercial drone operation. Nevertheless, our leading proprietary commercial players may be forced to go open with their development tools during this decade if one of them moves first, or if the open source community is able to develop reasonably good software for drone package and people delivery, and raise funds to get it certified by regulators. Fortunately, the US military is already recognizing the power of an open development approach, using both open virtual- and closed physical-world testbeds for swarm drone R&D in defense applications. In 2018, DARPA’s OFFensive Swarm-Enabled Tactics (OFFSET) program has begun working with two large systems integrators, Raytheon and Northrop Grumman, to create open architectures (physical and virtual), collaboration interfaces, and tactics exchange platforms, for small academic and business teams to use, and these systems integrators are developing closed physical testbeds to validate new unmanned systems designs and strategies. Such a dual-security approach (open source and closed source security) is very wise, in my view, and should keep our military at the center of drone defense innovation. 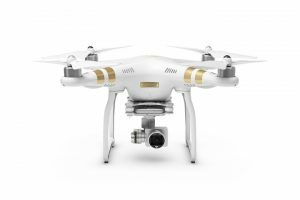 China’s DJI Phantom Drone (2017). DJI currently leads the global drone market. Returning to commercial uses, we may also see Alibaba, Amazon’s major global competitor, get into drones. An obvious strategy would be Alibaba, or an AI-oriented Chinese company like Baidu, partnering with or buying eHang, the current leaders in passenger drones, as well as DJI, the private Chinese company presently dominating the unmanned drone market. Perhaps DJI will go public, and make a big push into autonomous package-delivery drones, with advanced safety and noise reduction features. They could sell those to a vast range of companies. They could then launch their first human-carrying drones a few years after taking the lead position in the drone package delivery hardware and software space. I think such a strategy would give DJI the greatest future value and scale, but it would involve more risk and change, so they may not go that route. BYD (Build Your Dreams) is another impressive Chinese company that might well get into this space. Its founder, chemist Wang Chuanfu, has been called the “Elon Musk of China.” Like Musk, Chaunfu is a global leader in Li-ion batteries, solar panels, and electric vehicles. They are the world’s largest producer of electric cars, buses, forklifts, and other electrics, and have been profitable since 2002. Tesla, by contrast, has yet to turn a profit, though they do have great ambition and tremendous public goodwill. BYD is a question mark at present, but if they get into this game they’d be strong innovator and competitor. I think the long-term global future of drones, as they are so beneficial to all of us, deserves an open IP, publicly funded, global innovation approach. Open source development and testing will make progress and is highly desirable, but it is probably unrealistic to expect it to to be commercially and legally viable in the first decade of commercial drones. Amazon, Google/Waymo, Uber, and Boeing are all US companies I’d love to see as leaders in this race, but it would also be good to see Chinese companies like DJI, BYD, Alibaba, Baidu, and of course Europe’s Airbus, also in the competition. But we need them to play fair as well. China’s leading solar manufacturers dropped world prices by 80% between 2008-2013, which made them globally dominant, but they had extensive government support in the process. America should have offered the same level of support to our solar innovators, but we didn’t. If future drone leadership is totally dominated by China, or by any other non-US company aided by government support, that will be mud on the faces of US politicians in both parties who don’t believe smart government subsidies aid US economic growth and innovation leadership. We innovated many of these drone ideas, and the race is ours to lose at present. As with solar panels, electric cars, fuel cells, and other future-critical technologies, smart US government support and subsidies are sorely needed in the production and sale of advanced drones, which are a clearly a coming transformative technology. In my view, America sorely needs government policy with drones that is neither right wing or left wing, but up wing, or progress-oriented, advancing priorities like the Five Goals and Ten Values. We need to be proactive, not reactive, to the trends and futures in front of us. People will continue to migrate to the cities, but affordable housing density increase, the main contributor to gridlock, is much harder to scale than affordable air transportation, which reduces it. The better broadband and AR get, the more often people will telework. It’s going to increasingly be more efficient, for much of our work, than physical commuting. Population growth has been negative in our developed countries for decades now. Global population will peak around 8.7 billion circa 2050, give or take a decade, and decline rapidly from there. China, for example, is now (2018) losing 5M a year in its working-age population. The Chinese government projects their total population to peak at 1.45B in 2030, and to decline by 30%, to 1B, by 2100. Their two-child policy, started in 2015, is not producing nearly as many second child families as they hoped. They’re going to have to offer more economic incentives to induce parents to have that second child, in order to have all the working youth they presently think they will need to pay for their aging population. But China is a fast learner, and they’ll soon learn that automation and AI, two areas they are seeking lead, are far more important than youth demographics in creating prosperity for all. Higher standards for childraising, and a preference for fewer kids than our parents, on average, are global inevitabilities, the richer we become. It will be great if they help more parents with the economic burden of childraising, but China’s parents already know that better educated and more entrepreneurial children are usually a much better choice than more children. As the saying goes, as China goes today, so should the rest of the emerging nations go in the next few generations. These coming air transportation networks are much faster, more efficient and scalable than our current urban transportation systems, except in those cities that have already invested billions in mass transit. Unlike cars, which sit unused 95% of the time, the coming on-demand air taxi networks are much like trains, with the vehicles being reused continuously, and increasingly intelligently, creating a maximal social and economic benefit to offset the environmental cost of building them. They are also far more point-to-point capable than trains, so they are the best choice for our urban mass transit investments, going forward. Yes, the increased performance we get from these networks will cause us to use them more than we do today’s delivery and commuting networks. But people can only increase demand so much, because we are people. Our biological needs are sharply finite. The smarter our machines get, the more their transportation needs will dominate, not ours. Once we understand the Race to Inner Space, it’s pretty obvious that tomorrows smart machines won’t be consuming physical goods at anything like our rate, or physically moving their bodies around to sightsee, like we do. They’ll have much more interesting and efficient things to do, as we discuss in Chapter 2 of the Guide. So as a rough guess, I’d bet annual car and drone production starts decelerating some time mid-century as well. But in the meantime, we can expect an exponential adoption and production ride. Are you looking for a great problem to solve? This one could be yours. 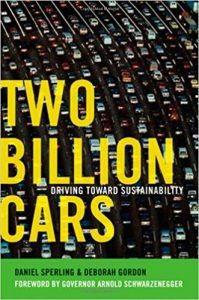 Sperling and Gordon’s Two Billion Cars (2009) is a nice little book that aptly described some aspects of the future of transportation, and the forces preventing that future, when it came out at the time. The authors made the case that we need to decarbonize our autos and trucks as soon as we can. There were over a billion cars in the world at the time, and they projected we’d add another billion cars by 2030. They explored a number of ways that short-sighted our politicians, auto execs, and the oil industry have blocked or stalled decarbonization innovation. In developed economies like the US, transportation produces nearly 30% of greenhouse gases, and cars and trucks alone cause nearly 20% of all greenhouse gas emissions. Since there are so many economic incentives for the big players and their captured politicians to delay and go-slow our switch from fossil fuels, and the developing world gets cheaper ICE cars every year, they explore why transportation sector’s greenhouse gas emissions are going to get worse before they get better. But foresight is a tricky thing, and unless you make your process as open as possible, it is easy to miss big parts of the future. Though they discuss electrification, the authors did not recognize how fast electric vehicles would improve and spread, driven by inner space efficiency trends. They also say nothing about autonomous cars, even though they’d been around since 1995, and nothing about on-demand transportation. To be fair, Uber started in March 2009, but the iPhone launched in 2007, and the near-Uber service Taxi Magic began operations in 2008. All three of these solutions, electrification, autonomy (in the air and on the ground), and on-demand services, are great ways to create a much more sustainable transportation network, and I’m probably missing some other general solutions as well (see any? let me know). Someone should write a followup book, called Two Hundred Million Self-Driving Cars and Drones, that describes the greatly dematerialized (intelligent, autonomous) and densified (miniaturized, efficient) future of urban transportation. Unfortunately, given our current global leadership, I expect the negative scenario outlined in Two Billion Cars is likely to materialize. Another billion of today’s unintelligent, carbon-belching fossil fuel cars are likely to be produced and driven globally in coming years. But at the same time, we can now see that the safe, sustainable, affordable, rapid-transit future we all want is waiting patiently ahead: on-demand autonomous electric cars and drones, delivered in intelligent air delivery and air taxi networks. Convair Model 118 (1947). A plastic car body, intended to attach to a rentable airframe at your local airport. If America gets commercial air taxis and private passenger drones in the mid-2020s, that will be about one hundred years after the Ford Flivver (1926), a personal plane designed and sold by Henry Ford, for individual garages. Ford was the world’s first flying car entrepreneur. We’ll get them eighty years after the Convair Model 118 (1947, picture left), and the Taylor Aerocar (1949, picture right), and sixty years after that future-visioning cartoon series The Jetsons first aired in 1962. See What Happened to Flying Cars?, Second Thought, 3.28.17 (YouTube, 7 min), for some of that great history. My grandmother watched us go from Kitty Hawk to the moon in sixty-seven years. I was born in 1960, and I bet I’ll see us go from the Jetsons vision to its real-world implementation, in roughly the same amount of time. That is a great example of accelerating technological change, a topic I study at our little nonprofit, the Acceleration Studies Foundation. Some aerospace experts, like Jim Harris, in We won’t be flying in electric planes for at least 15 years, CNBC, 10.13,17, argue we won’t see these in the US until the 2030’s. But given what we’re seeing in Dubai, which plans to launch their first air taxi service this summer, I think he’s being too conservative. I bet we’ll see commercial air taxis in the US within ten years, maybe even earlier. Uber’s CEO, Dara Khosrowshahi, now says he thinks Uber could be offering them to their first customers in five to ten years. Just give us those parachutes and airbags, please. Pretty please. If you want to follow or join this emerging industry, two good conferences are AUVSI’s (Association for Unmanned Vehicle Systems International) XPONENTIAL conference, which has been going since 2012 (it was previously called Unmanned Systems) and the Uber Elevate Summit, started in 2017. AVUSI is the largest unmanned systems and robotics community, at 7,500 members, and their conference has about 8,000 participants. It is mostly defense and industry oriented. Elevate is much smaller, but its very helpfully focused on the commuter drone vision. There a number of other good drone conferences, but none to my knowledge that focus on delivery drones. Some entrepreneur should start one soon. 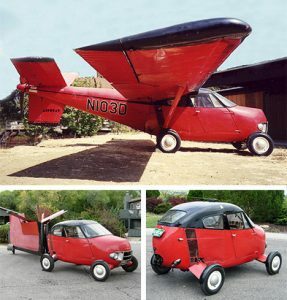 The next time someone says to you, in a sarcastic tone “Where’s my flying car, mr/ms. futurist?” You can tell them it’s finally in view. You can also tell them advances in nanotech (sustainable power), infotech (self-flying), safety engineering and noise engineering were key hurdles that had to be overcome before we had a clean, safe, and affordable solution for millions of commuters. Some great futuristic ideas take time!